Very important: no matter how well you did it in the last game. If you fail to solve all the static math problems, no records of your performance will be saved. You also need to play a game with at least 3 static panels active to increase the number of games won in the statistics. You can change the maximum active panels in game configuration. By default this number is 3, so be careful because you can win, but it won’t be reflected in your counter. Increase the number of active static panels to 3 if below so every match counts. Also, if you play with the help drone active (Stadium Arena) or with enemies deactivated, achievements and statistics will not be saved. Note: more achievements will come in the future. We could also add achievements suggested by you. 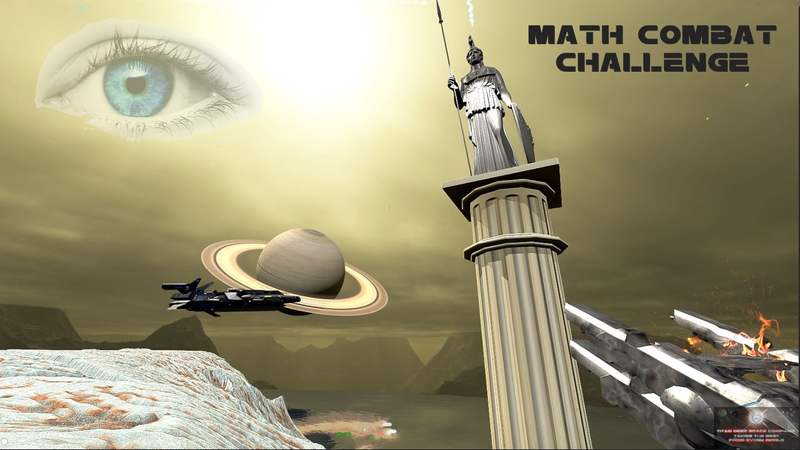 Note: Check out the manual for information on how to play Math Combat Challenge. Math Combat Challenge will give you achievements when you achieve certain goals. There are also two types of statistics: one of them internal, which you will see on the final screen. Another general, which will accumulate on a server, in this case the Steam server. Achievements will also be visible on your Steam account. First, the points are increased the higher is the difficulty level. At the easy level, there is never a score. The easy level is a level of training without points. Medium level gives you the points multiplied by 1. Level hard by 2. And level crazy by 4. Second: the inverted numbers (the numbers that function as wildcards, i. e. are inverted and are the value you are currently looking for) help a lot in the game. Imagine you’re looking for a “6” on stage. But you see an inverted “7”. If you shoot him, that “7” will serve as if it was a “6”. It’s a wild card. If you activate this function in the config panel, the number of endpoints in a line item will be divided by 6, and will never in any case be greater than 100. Achievements (remember, minimum level: medium). Win stadium a number of times (will increase in the future). Win Asteroid field a number of times (will increase in the future). Win Titan a number of times (will increase in the future). Math Ranks are obtained from cadet level to admiral level, increasing difficulty. Not only the points obtained count, but also other elements. Remember also that the points are increased by one in the middle level, by two in the difficult level, and by four in the crazy level. These levels are basely on the US Navy ranks, but this is a game based on a scifi novel in the future, and things have changed in the future. Symbols have changed in many ways in some ranks. More ranks will be added in next versions. Ranks and how to obtain them. Note: ranks are earned when the arena played has at least 3 static panels. Similarly, an arena won with less than 3 panels will appear in the internal statistics, but will not be counted. Arenas with less than 3 panels are for practice but does not accumulate. Note 2: remember: because of this, you can win, but it will not increase your counter if there weren’t at least 3 statics panels active. Cadet Win any arena and obtain 250 points. Note: next achievements are not cumulative. For example, you could be Gold while not being Iron or Silver or Bronze. It’s up to you to match exactly every condition to get the achievement. These are the permanent statistics that will be saved in your Steam user. Points for every level in Stadium, Asteroid, and Titan Arenas. Dynamic sums, subtracts, products, divisions, and equations solved for every level. Static sums, subtracts, products, divisions, and equations solved in general. Games won in medium level. Games won in hard level. Games won in crazy level. Record time it has taken to solve a scenario. As long as the stage is played at least in the middle/hard/crazy levels, and with four static panels. Here you can see how points are calculated in the gamed based on your performance while solving math problems and fighting the enemy. Also remember that bad shots takes energy out from your shields. Check out the manual for more information. Letters destroyed are multiplied by 3. Books recovered are multiplied by 5. Shots fired at wrong flying numbers are multiplied by -3. Shots fired at right flying numbers are multiplied by 4. Total number of static math panels solved are multiplied by 10. Total number of dynamic math panels solved are multiplied by 5. Total number of dynamic math panels wrong are multiplied by -3. Total number of dynamic math panels not solved are multiplied by -4. Total flying enemy ships are multiplied by 3. Total number of dynamic math panels solved are multiplied by 6. Total number of dynamic math panels wrong are multiplied by -1. Total number of dynamic math panels not solved are multiplied by -2. Total enemy carriers destroyed are multiplied by 5. Total enemy light carriers destroyed are multiplied by 3. Zero errors in dynamic panels multiplies points by 5. One error in dynamic panels multiplies points by 4. Two errors in dynamic panels multiplies points by 3. Remember: there are strategies to subtract failed dynamic panels. Take a look inside the Forsaken Base in Titan, or destroying some heavy ships in space. Those strategies will you a change to reduce the number of failed dynamic panels. Note: hard level multiplies final points by 2. Crazy level multiplies final points by 4. Note 2: in Stadium, using the help drone is for practice, no points will be added if active. Note 3: the math balls (the balls that fall from the starships), not only are used to destroy some enemies at the same time. When you shoot them, they increase points for a while. Note 4: using the Minigun, the Owl Drone, the Titan Tracker Drone, and the Combat Mech is great, but will subtract some random points from your total. After 2 times that don’t affect the final points, the more you use them, the less points. Use them wisely, sometimes is good to lose some points but winning a battle that could be lost.